Tameside Council and NHS Tameside & Glossop CCG have come together to form one organisation – Tameside & Glossop Strategic Commission. We have developed together a new corporate plan that reflects the priorities and guiding principles for our joint work in the area. This is the first corporate plan to pull together the objectives of the Strategic Commission. ‘Our People Our Place Our Plan’ outlines our aims and aspirations for the area, its people and how we commit to work for everyone, every day. 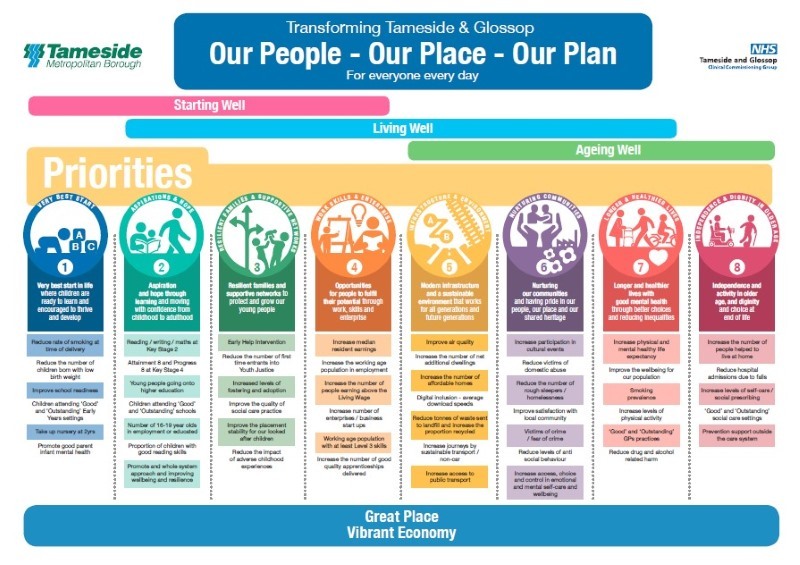 The plan is structured by life course – Starting Well, Living Well and Ageing Well, underpinned by the idea of ensuring that Tameside & Glossop is a Great Place, and has a Vibrant Economy. Within each life course we have identified a set of goals that set out what we want to achieve for people in the area throughout their life. The plan is supported by a list of our public service reform principles that define the ways of working we will take on to achieve those goals. The principles are Greater Manchester-wide idea that we have adopted locally and will redefine our relationship with residents – doing with, not to.